So I have this 5-yr-old niece who would love The Secret World of Arrietty (Kari-gurashi no Arietti). She’s got a twin brother and an older sister who take after their father — blonde, loud, socially charming, hyperactive. In contrast, this one is her mother’s child: dark-haired, quiet and imaginative, and prone to artistic focus for hours at a time. She would be entranced by the slow-moving beauty this film displays, because she’s very little, although not quite as small as Arrietty. 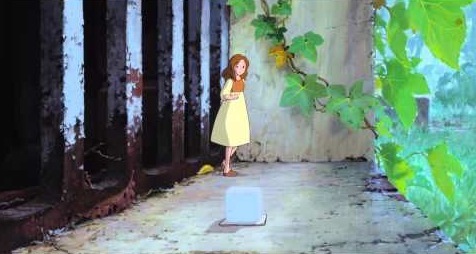 I can’t help but watch Arrietty with a sense of regret. Hayao Miyazaki didn’t direct this film, but his hand is all over it as screenwriter, production planner, and having the whole thing done via his Ghibli Studios. Miyazaki refuses to make those computer-animated, jacked-up, and over-caffeinated films that fill theaters. In fact, our theater prefaced this film with at least ten previews for kids’ movies — Brave, Mirror Mirror, The Lorax, and The Pirates (a new claymation film by the Wallace and Gromit people) most notable among them — all supercharged and moving so quickly you feel like you’re missing half the action. 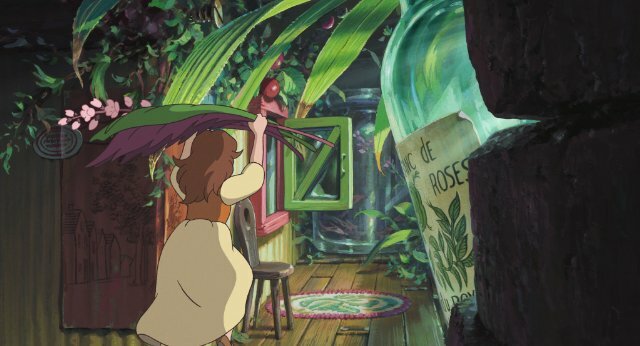 In contrast, Arrietty takes its time, lets you pay savor every beautiful, hand-drawn and colored shot. The down side: it can get a little dull. Also: the dialogue can get pretty creaky for people over the age of 5. But mostly: it’s not weird, like Miyazaki’s best films, such as Howl’s Moving Castle (2004), Princess Mononoke (1997), and Spirited Away (2001). Arrietty is based on Mary Norton’s The Borrowers (1952), a book I remember only loosely — but what a great idea for little kids. 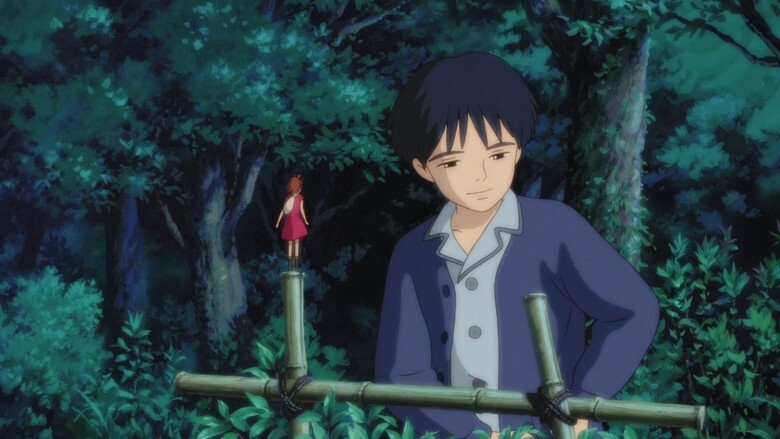 Arrietty and her parents are tiny people who live under the floorboards of a country house. They are borrowers — that is, they take little bits of things that the family will never notice, like a sugar cube, pins, tissues, a bit of string, and only things that allow them to survive. It’s a kind of big fish/ little fish symbiosis scenario premised on a couple of things: they must borrow without being seen, and if they cease to be secret, they must move away to a new house. What child wouldn’t want to think of a tiny family cobbling together a mirror house underneath your own, and stealing a postage stamp or a fish hook here & there to make life a little easier? It’s a strange film to see as an adult, as it’s really more appropriate for small children. 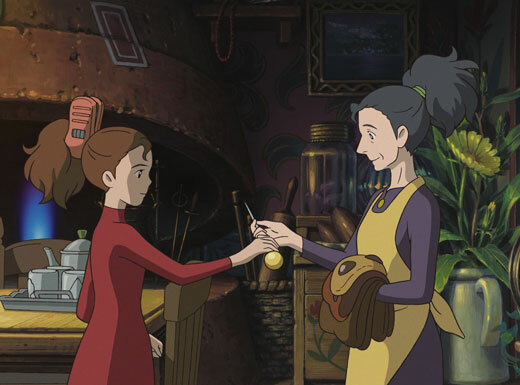 Arrietty’s parents are voiced recognizably by Amy Poehler and Will Arnett, two of the funniest people in show business, but they’re weirdly low-energy and unfunny. It’s as if they’ve received mild lobotomies, which distracted me from the story — even though I knew I wasn’t supposed to think so much about the voices behind the characters. There’s also a prevailing sense of sadness in the tale that works together with the film’s slowness and visual wonder. Sadness because the boy Shawn arrives at the house to prepare for his upcoming heart surgery while feeling neglected by his busy professional mother; and sadness because Shawn spots Arrietty, offers her the gift of a sugar cube, and gradually becomes friends with her, making it necessary that the borrowers leave their lovely house for parts unknown. Sadness is a strange mood to prevail over such a lovely film. I love what the Ghibli filmmakers decided to do in creating this world: although the characters big and small are all obvious cartoons, the backdrops are beautifully realistic, if idealized. When Arrietty climbs the ivy up the side of the house, the ivy is portrayed in all its colorful, light-filled, twisted majesty. The camera occasionally scans a meadow full of flowers and bugs. Or it scans upward to watch light coming through the leaves of a tall tree. For tiny children, such scenes must be even more entrancing than for adults — a reminder to observe the world around you with even more attention in case you might catch a glimpse of a tiny girl in a red dress, slipping amongst the leaves. 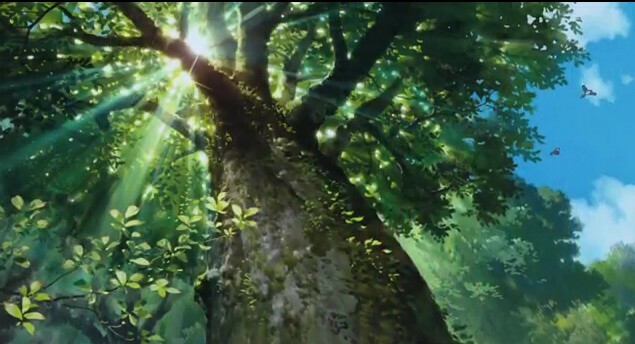 But for the rest of us Miyazaki fans, it’s beautiful yet disappointing and oddly tame. What I love about his sometimes ponderous films is the way they take strange turns, display strange and dark motivations, and feature female characters who must address scary situations they’re not really prepared for, either emotionally or physically. At times, as in Spirited Away, the girl is not even very likeable for a while. 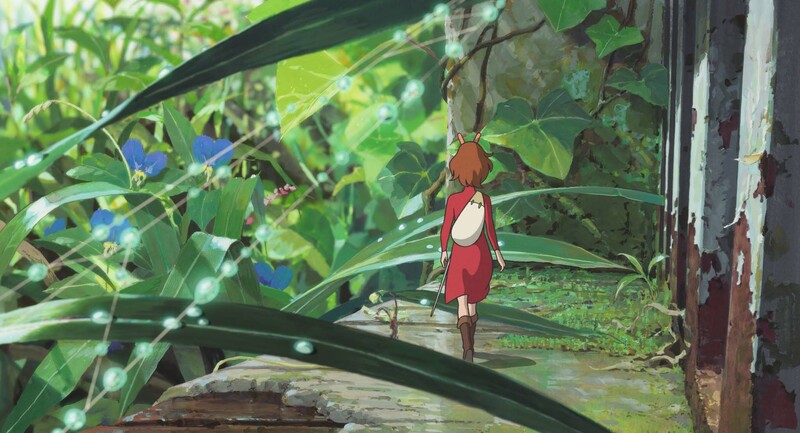 Considering that Arrietty clocks in at a tidy 94 minutes (speedy by Ghibli standards), it’s kind of boring. As much as I found myself disappointed by the film, I’ve got it on my list for the next time I see my little niece, who has all manner of weird things going on in her little mind. She’ll love it. It might even be one of those films that hits her quiet 5-yr-old mind in that way that means something beyond the shape of the actual film. Because really, how do we know how film works the way it does? How do we know what will stick in our minds as meaningful long after the fact?